Piqua, Ohio, Aug. 28, 2017 — Hartzell Propeller has added to its series of how-to videos for pilots and mechanics. 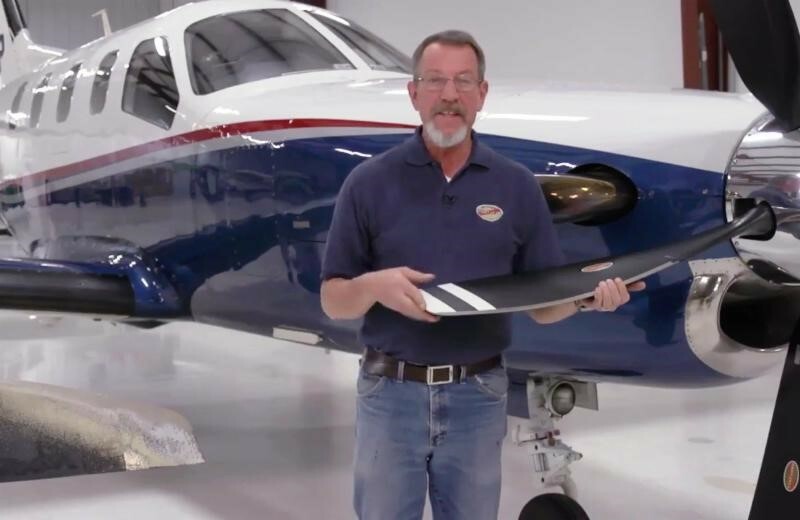 The newest video covers the evaluation of structural composite propeller blades by describing the ins and outs of composite prop pre-flight checks for pilots. In the video, Ryan also addresses trailing edge impact damage from tow bars or other ground handling equipment. He describes airworthy damage limits and how to properly “coin tap” the blade to detect evidence of possible delamination. Hartzell uses aerospace grade composite construction materials that are incredibly durable, but they are not entirely immune to damage. Unlike aluminum or wooden blades, Hartzell’s composite propeller blades can be restored to their original dimensions over and over again, providing excellent life-cycle costs. Celebrating its 100th year, Hartzell Propeller is the global leader in advanced technology aircraft propeller design and manufacturing for business, commercial and government customers. The company designs next generation propellers with innovative “blended airfoil” technology and manufactures them with revolutionary machining centers, robotics and custom resin transfer molding curing stations.